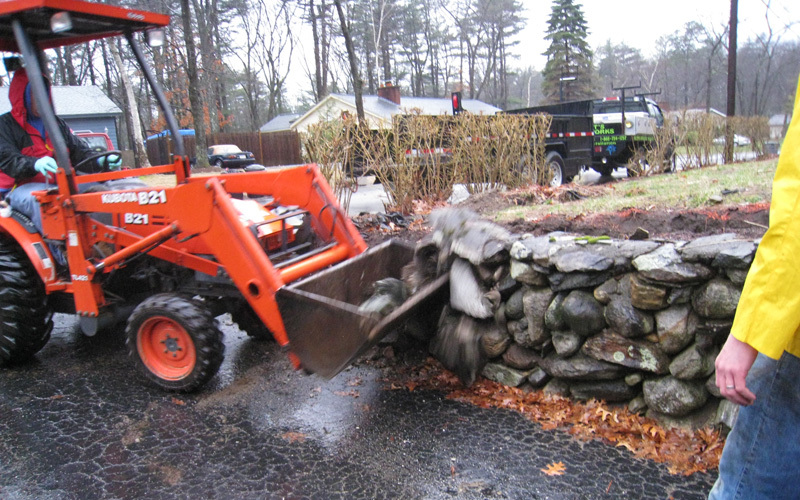 You are currently browsing the tag archive for the ‘rock walls’ tag. The puppies announced the arrival (*before* 7 AM) of the workers come to take our worries and rocks away. After a 10-15 minute second-by-second update from Dixie and Duncan (woo-woo! and woof!, they settled in on the front couch to watch. The noise was unsettling, but with their human pack leaders in sight, they settled in and even escaped to inspect the project up close a time or two. 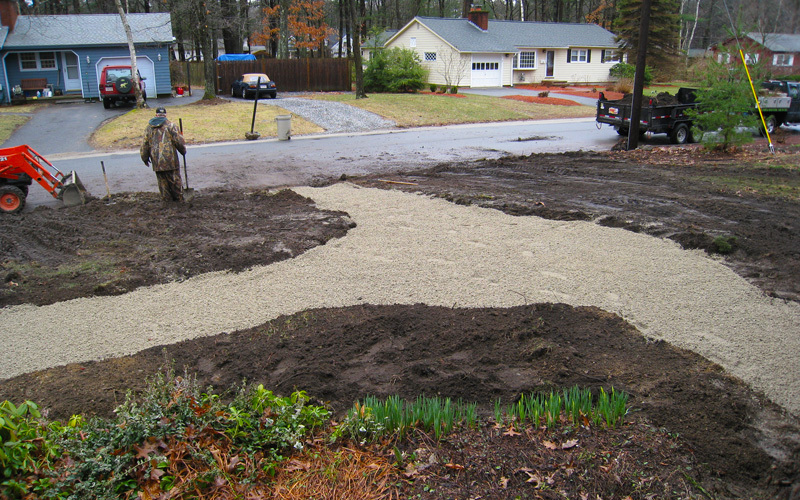 After finishing the driveway rock walls, the crew turned their attention to scraping the front lawn (goodbye dandelions! goodbye weeds! goodbye grubs! goodbye green stuff we mowed and called ‘lawn’! 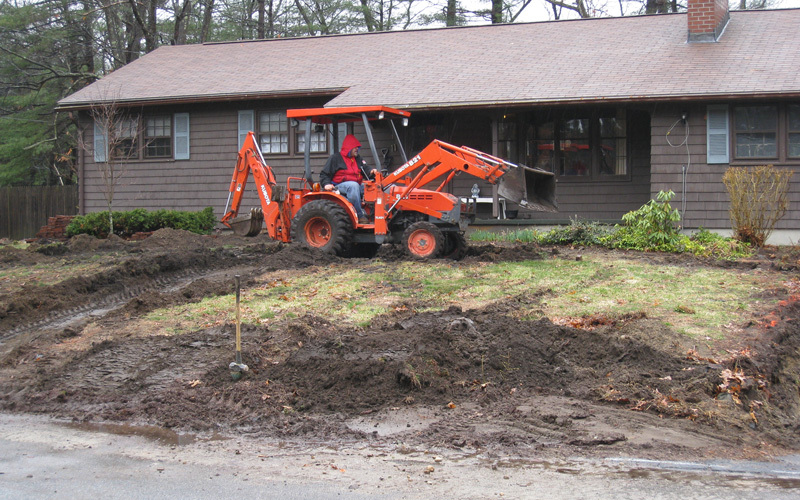 ), smoothing out the grade from the house to the street, removing the forsythia (DH has always hated it—allergies, don’cha know) and assorted other plantings (did you know that the pretty Flaming Bush is considered an invasive plant in Massachusetts? I can show you why…). Fortunately for me and my shoes, the base for the brick walkway was spread before I had to climb through the mud to the front door tonight. Yes, Dave and his crew are definitely our new best friends. They worked 11 hours straight in raw, wet weather. The only mud in the house came from our puppies. I’m exhausted just thinking about it. And they are due back tomorrow. Brick time! 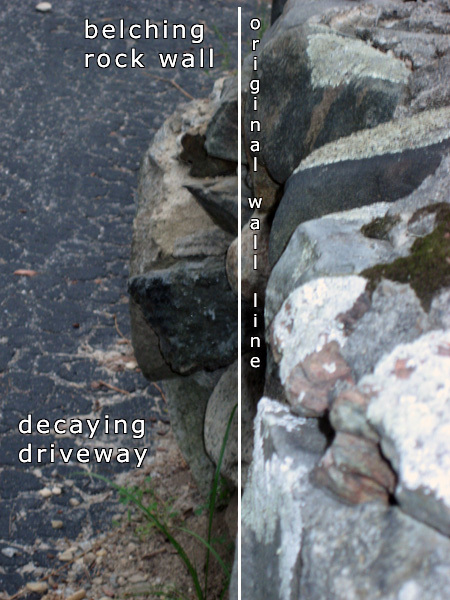 Dave is tearing down (more like the wolf who huffed and puffed, because there is not much holding them upright at this point) our decrepit driveway walls tomorrow. To prepare for this event, over the weekend we had to tear up relocate the plants along the walls and consider where their best survival rate location would be just in case they stayed there for… um… a year or more while we dithered, disagreed, and fussed over the *best* relocation location. DH excavated the wiring to the front lamp which turned out to have been embedded in concrete. Not salvageable. It looks like a drunken sailor listing to port (starboard?) in this picture. 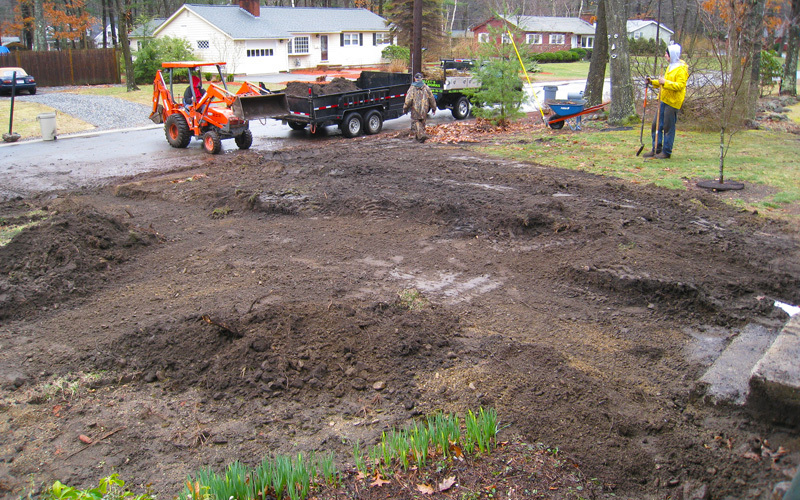 This image also shows the earth eruptions of plant excavation. 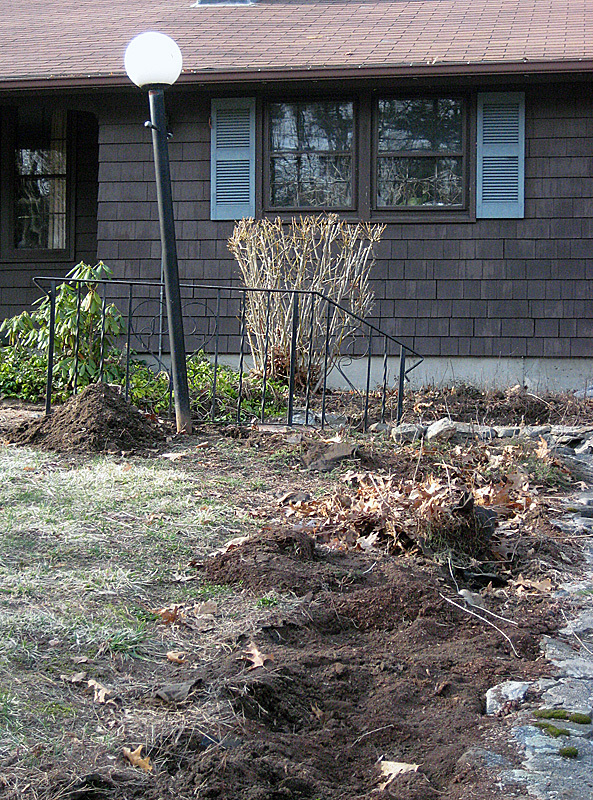 The Hosta struggled mightily with the ever-expanding chipmunk condo residents of our rock walls. I have no doubt it will survive and rejoice no matter where we put it as long as it is away from the tiny rodents nibbling on its roots. The poppies are probably *not* going to weather the move because they really haven’t liked anyplace I have tried planting them here. 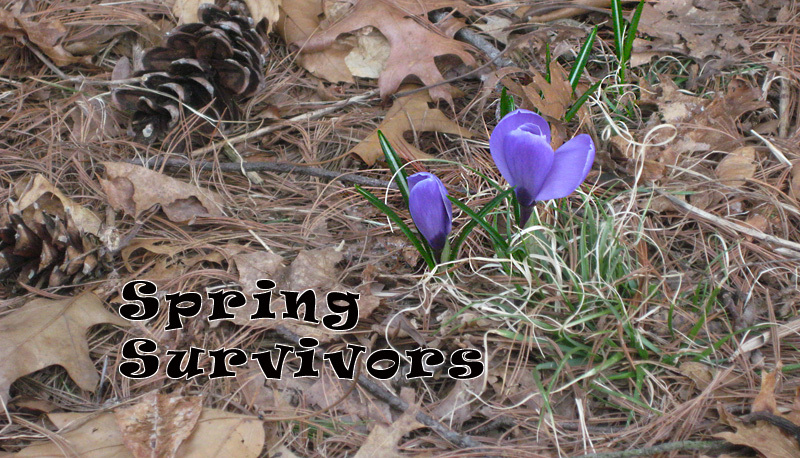 Planting flowering bulbs, tubers, and bushes are really like longer-lasting floral arrangements for me. Most die or do not come back as nicely in following seasons. My sister inherited all of Grampa’s gardening glory. Like him, her touch and casual (but passionate) gardening efforts always brings out the very best that any plant can offer. Me, not so much. In preparation for bringing the walls down tomorrow, our best friend Dave came this morning at 7:10 AM and literally shoveled up the remainder of the front brick walkway. The same bricks we had been picking out one by one and stacking, he just came and shoveled up out of the ground in a matter of moments. 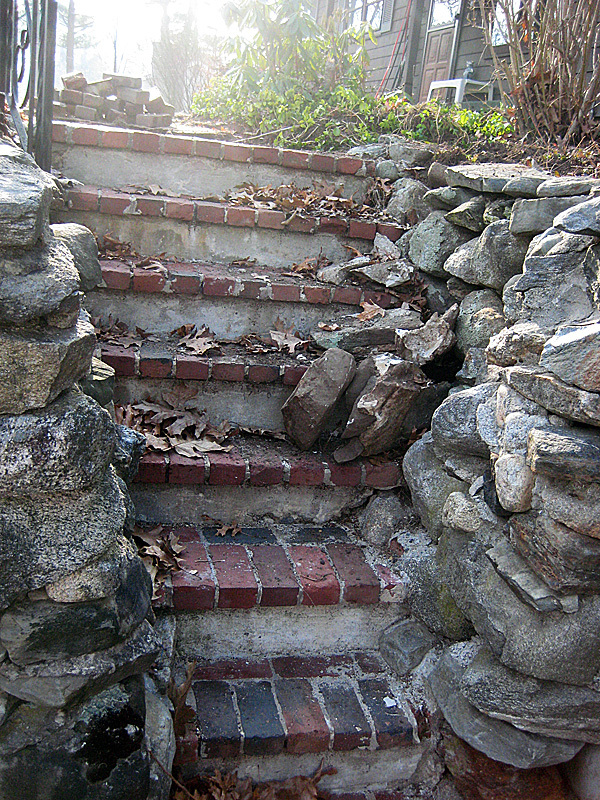 Since the stairway was built into the rock wall itself (and repaired a few times after harsh winters), they actually have some concrete holding them up and together. Not so the rocks they were built into. 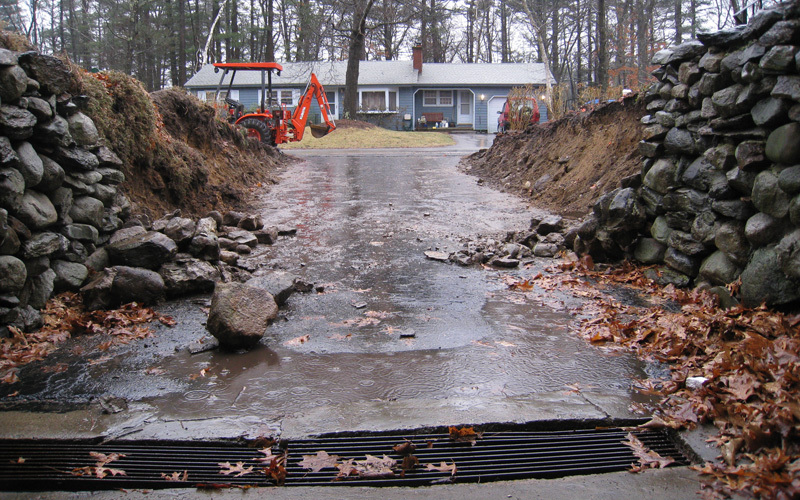 The general theme here is that access to the driveway is hazardous. Access to the side parking pad is impossible due to the mountains of gravel already dumped in preparation for the new walls. As of this evening, I have about ten feet at the extreme left of our property to park on the street to be out of the way of the workers who will be bringing trucks and heavy equipment to remove the big rocks at…um… around 7-7:10 AM tomorrow morning. 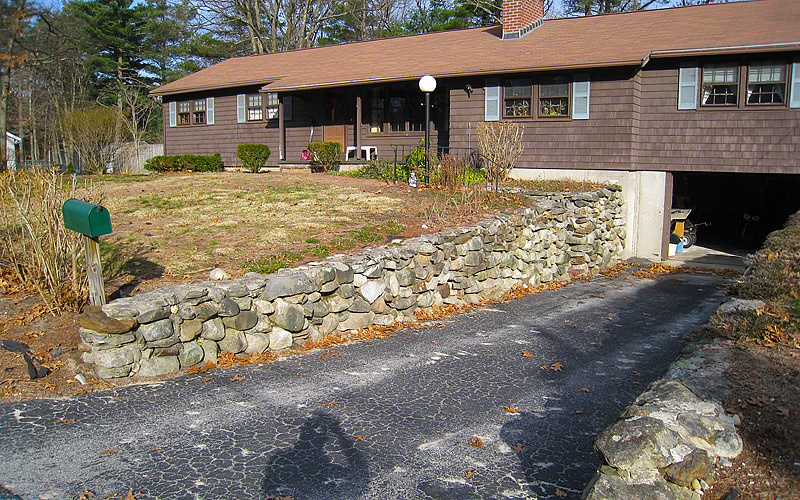 The original owner of our house built these walls. I hear he was very proud of his labors. 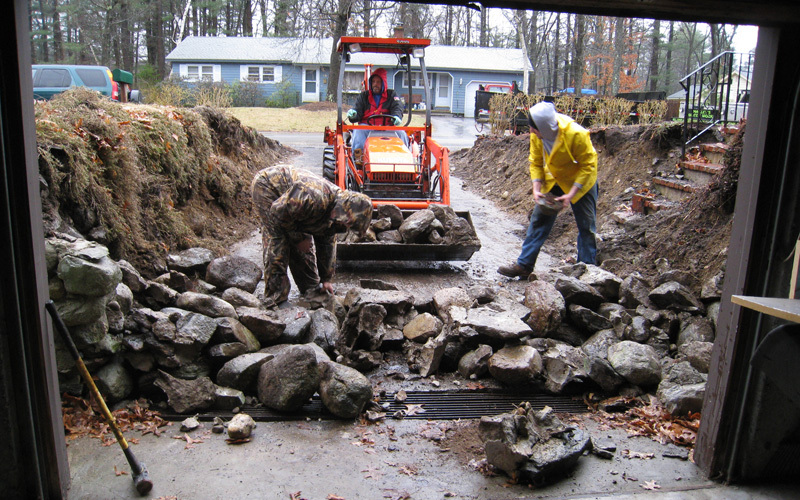 Stone by massive stone he built the walls of our driveway and made yearly repairs to same. Over the past dozen or so years of our residence we have taken these walls for granted; cursing, but still turning a mostly blind eye to the chipmunk nation that has taken up residence in the walls. With their persistent burrowing, more and more of the sand and mortar holding the rocks in place have been dislodged and pushed out like we take out the trash. 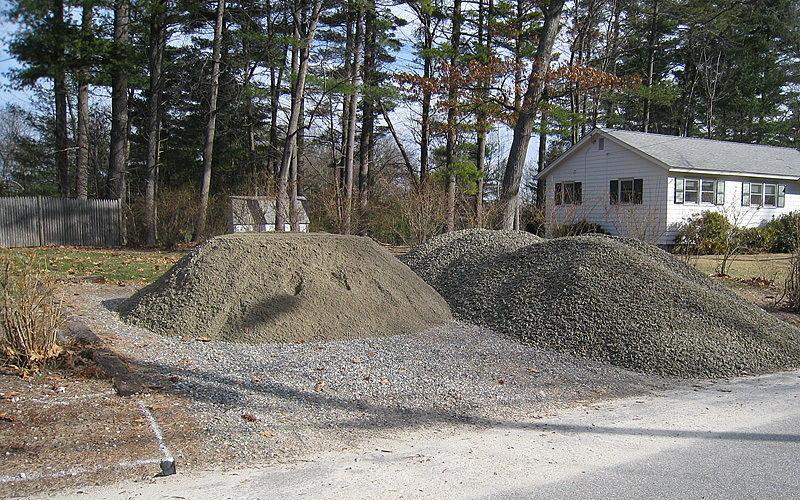 The resulting piles of sand reminded me of the sands in an hourglass, marking the time until no sand or mortar was left to hold the massive stones in place. By last winter the gradual swelling of chipmunk breeding made the outer edges of the walls look like a swollen belly in mid-belch and I stopped parking in the driveway. This change in behavior, more than anything else, convinced DH there was something to be concerned about. 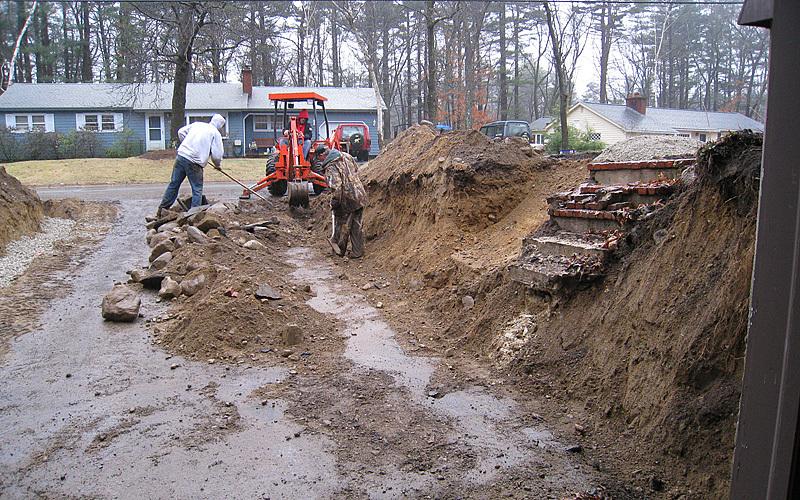 The driveway, like the walls, received just as much care as the walls did over the years. Frost heaves, common up here, split the asphalt surface showing it to be a thin coating instead of a proper layer. A simple recoating of tar or asphalt would not fix it. We needed to replace it. It is a leap of faith to commence such a project when the economy is what it is, but we do have it in savings and waiting longer would make the expense *much* worse. And it will look loverly when done.. I think one of the reasons DH is looking forward to the completion of this project is that it means the forsythia lining the street in front of our property will be ripped out. He hates forsythia with its pollen that coats both the ground and the emerging leaves because it drives his allergies haywire. If I spent all my waking hours sneezing from it I might feel the same way. But since I don’t, I’ll miss the cheery yellow greeting me in the morning and as I come home at night while it is in bloom. But I’ll enjoy being able to park in the driveway more than I’ll miss the forsythia.